Vodafone, India’s 2nd largest GSM mobile service operator today launched all new CAMPUS PACK-2010 with lowest Group calling and Free GPRS access for its prepaid subscribers in Mumbai Circle. 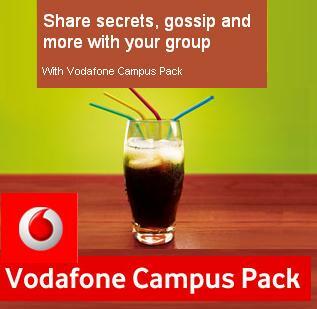 The New Campus pack is priced at Rs 49 which comes with a tariff validity of 1 year. It provides the special call rate benefits with which you can talk @just at 10 paisa /minute anytime within the group up to 5 Local Vodafone users. All local calls other than the group members will be charged at just 50 paisa/minute with the condition being that the 1st minute of the day will be charged at Rs.1 per minute. All STD Calls to any network across India will be charged at 50 paisa /minute. What’s more is you also get Free GPRS (Vodafone Live) up to 50 MB per month. Subscriber will get Full Talk time on subsequent recharges of Rs 50/100 & 200. With new Campus Pack local SMS to any network will be charged at just 10 paisa per SMS with the condition of 1st SMS of the day will be charged at Re.1. While National sms will be charged at 1.50 paisa and International SMS will cost at Rs.5. The best part or USP of this tariff plan is that there is NO DAILY RENTAL and FREE GPRS for enjoying this new Campus Pack. For more, Call Vodafone Care on 111 from your Vodafone mobile phone or on 98200-98200 (Prepaid) from any phone.